Sushi rice (or shari) is subtly sour, sweet and salty with a boost of umami. It isn’t just a foil for the gu, the ingredients that are mixed in, placed on top or wrapped around it. If the rice is not right, the whole dish is ruined. 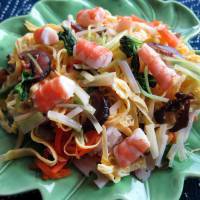 It needs to be the best quality that you can afford, since it is the star of any sushi recipe. It should be cooked until it’s a bit firmer than plain rice (many rice cookers have a “sushi rice” water level marking). And then there’s the balance of flavors that are added in the form of sushi-zu (flavored sushi vinegar). Every sushi restaurant has its own ratio of sweet, sour and salty for their sushi-zu, and if the ratio is not to your liking, it may throw off the entire balance of the dish. Even world-renowned sushi restaurants, such as Sukiyabashi Jiro, have their detractors, who consider their shari to be too sour. This is especially true for people who grew up in areas of the country, such as the Kansai region, where sushi rice tends to be on the sweet side. In most cases, sushi rice should be served at around body temperature — an exception is mushi-zushi (steamed sushi), from Kyoto, where layers of rice and cooked ingredients are steamed in wooden boxes until warmed through, before serving. Since raw fish needs to be chilled before it’s handled and the rice can warm up the fish, the ideal nigiri-zushi is eaten as soon as it’s made at the counter by a professional itamae (chef) who makes each morsel for you seconds before it’s popped into your mouth. If you’re serving sushi at home, unless one person dedicates themselves to being the itamae for the day, it’s easier to serve chirashi-zushi (scattered sushi) or temaki-zushi, where everyone makes their own handrolls at the table. This month’s recipe is for a colorful chirashi-zushi that’s perfect to serve on March 3 for Hinamatsuri (Girls’ Festival) or any festive spring occasion. 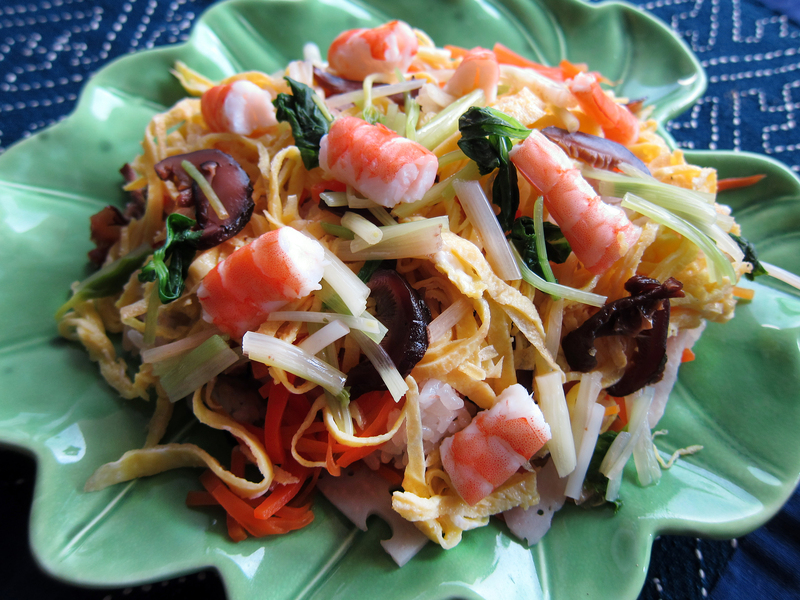 It only uses cooked ingredients, so it can be packed for an ume plum or cherry blossom-viewing picnic, too. Combine the vinegar, sugar and salt in a small pan. Heat, while stirring, until the sugar and salt have dissolved. Set aside half for the rice and use the rest for the lotus root and shrimp. Remove the stems from the shiitake mushrooms, slice thinly and place in a pan with enough of the soaking liquid to cover, plus the soy sauce and mirin. Simmer for 10 to 15 minutes. Add the carrot and simmer an additional two minutes. Leave to cool. Cook the lotus root in boiling water with a little vinegar until crisp-tender. Drain and marinate in half the sushi vinegar for at least an hour. Cook the shrimp in lightly salted water until it changes color. Drain and marinate in a few tablespoons of the vinegar from the lotus root for half an hour. Make kinshi tamago (golden-thread eggs) by beating the eggs with a pinch of salt and sugar and cooking very thin crepes in a lightly oiled, nonstick frying pan. Cool and cut into very thin strips. Rinse the rice several times until the water runs clear. Put the rice in a rice cooker with the kombu seaweed, leave to soak for an hour and cook as usual. Put the hot rice into a wooden sushi-oke (tub) or large bowl (discard the kombu) and pour the reserved sushi vinegar over it. Mix the rice rapidly with a paddle while cooling it using a fan (or hairdryer on the “cool” setting) until at body temperature. Blanch the mitsuba for 10 seconds in boiling water, then refresh in cold water. Squeeze out and chop roughly. Mix into the rice, along with the drained shiitake mushrooms, carrot, lotus root and sesame seeds. Arrange the rice in a serving container and top with the kinshi tamago, shrimp, more mitsuba and lotus root. Add some ikura (marinated salmon eggs) for even more color.